Arbor-Nomics® > Blog > Seasonal Upkeep > Get Your Atlanta Lawn Halloween-Ready! It’s hard to believe October is already here! 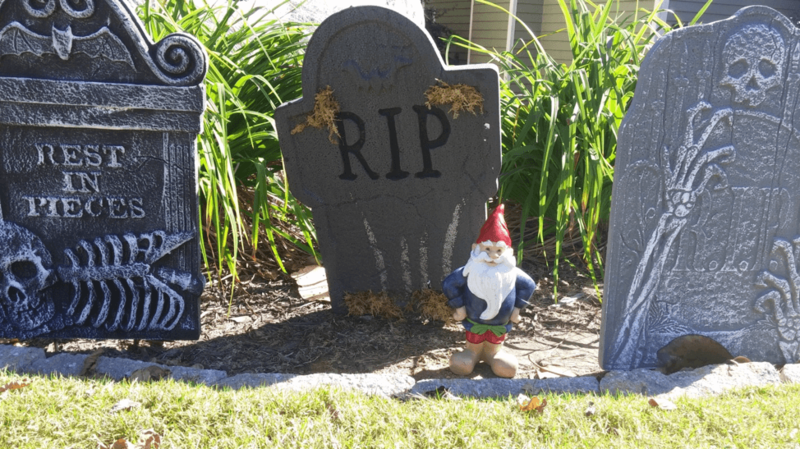 As you get into the Halloween spirit and start thinking about decorating your yard, there are a few things you may want to consider. We’re all about being festive, but a few easy measures can help to ensure that your Atlanta lawn doesn’t suffer. Clear the Leaves:Now’s the time for a quick yard clean-up. Remove any fallen leaves, sticks or other debris from your lawn. These things not only suffocate and damage your lawn by breeding diseases, but also pose a slip-and-trip hazard for trick-or-treaters. Do your best to keep your turf healthy, and your neighbors safe by removing any obstacles, including any toys that may be scattered about after your summer fun. Trim Your Turf: Prevent matted grass on November 1st by mowing your lawn just before Halloween. Refer to our mowing height chart, but remember that if you’ve had aeration and overseeding on your Fescue lawn, you’ll need to wait until the new growth is long enough to mow. Rope it Off: If you have a Fescue lawn, it’s important to protect your newly seeded grass from this holiday’s heavy foot traffic. Stampedes over your immature turf will hinder lush, healthy growth. Consider placing stakes with caution tape around the perimeter of your property to guide neighbors to use your walkways instead of your lawn. Give Your Trees and Shrubs a Haircut: Prune any precarious branches from your trees and shrubs to remove potential hazards to passersby. This will also help enhance your curb appeal for the fall. Adjust Your Irrigation: Avoid watering your lawn on October 31st, unless it’s roped off. A wet lawn not only poses a slippery risk but also leaves your soil soft and more susceptible to footprint indentations and damage from Halloween foot traffic. Watering the next day would be a better option. Light the Way: Deter people from walking on your lawn by lighting a clear path to the candy bowl. Floodlights can help, but rope lighting and walkway lights will make it clear where you want them to walk. Station Yourself in the Driveway: Reduce the opportunity for trick-or-treaters to march across your yard to the front door by setting up shop at the end of your driveway. It’s typically a well-lit, open area that makes a perfect candy bowl station. Decorate Strategically: Of course, we love to get in the Halloween spirit, but put some thought into your décor. Place inflatables and other items with large surface areas on concrete or in natural areas rather than on your grass. Hanging decorations is another great option that won’t harm your turf. Get your lawn prepped now, so you can enjoy All Hallow’s Eve handing out treats and checking out all the creatively creepy costumes that pass by.